To report incidents of take or harassment of wolves, call Arizona Game and Fish Department 24-hour dispatch (Operation Game Thief) at 1-800-352-0700. In New Mexico call: 1-800-432-4263. Mexican wolves are protected under a special federal regulation, the Mexican Wolf Experimental Final Rule, whereby specific management rules apply within the Experimental Population Area, which includes areas south of I-40 and north of I-10 in Arizona and New Mexico. No private, tribal, or public land use restrictions are imposed, except for limited temporary closures on public land only, that may be established within a 1-mile radius of occupied release pens, active dens, and rendezvous sites in the Apache or Gila National Forests. Harass a wolf away from you or your property without injuring it, but you must report it within 7 days. Kill or injure a wolf that is in the act of killing, wounding, or biting cattle, sheep, horses, mules, or burros on your private or tribal land, but you must report it within 24 hours. 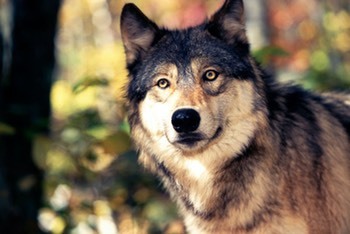 Kill, injure, or harass a wolf in defense of human life, but you must report it within 24 hours. Kill or injure a wolf just because it is near you or your property. Kill or injure a wolf that attacks your pet (including working and hunting dogs), regardless of land ownership (private, public, tribal). Kill or injure a wolf that is in the act of killing, wounding, or biting your cattle, sheep, horses, mules, or burros on public land without a U.S. Fish and Wildlife Service permit. Kill or injure a wolf that is feeding on a livestock carcass (you cannot assume the wolf killed it because wolves will feed on carrion). Violate official closures around occupied release pens, active dens, and rendezvous sites. Shoot a wolf because you thought it was a coyote or something else (you are responsible for identifying your target before shooting). Attempt to do any of the above actions or solicit someone else to do them. Violations of the above rules may be subject to prosecution. Criminal penalties may include imprisonment of not more than one year, and a fine of up to $50,000 and/or a civil penalty of up to $25,000. You will not be prosecuted for unavoidably killing or injuring a wolf, such as striking a wolf with your vehicle, but you must report it within 24 hours. Call the Interagency Field Team at 1-888/459-9653 or the Arizona Game and Fish Department’s 24-hour dispatch at 1-800/352-0700 to make any of the required reports discussed above regarding harassment or take (kill or injure) of wolves, or to report wolf sightings, encounters, or suspected livestock depredations. For more information about the Mexican wolf program, please see the contact information provided on the back.